Forget Pampered Chef, Candle Light, Thirty One and all the rest! Delectable Doghouse is introducing Pooch Parties thru Facebook! Let's get our little buddies together to socialize, while we do the same, over practical and innovative pet products for our pampered pooches (and kitties too)! Parties available every week night and all weekend. Fill out the Contact Us form below for more information how to set up your party. Set up your party today! You pick the place Pooch Parties. Your living room, back yard or even under a tent at your favorite dog park! Delectable Doghouse offers a variety of the latest in practical products for your pets. We make all of the products available at the party to tryout and purchase. Come ready to have a ball! 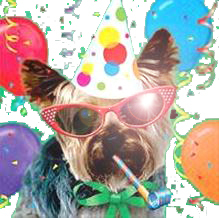 Contact us to set up a Pawty!